You step out into your garden, the fresh breeze welcoming you. You smell the distinct aroma of freshly mowed grass.You walk around, seeing the rows and rows of neatly tended plants and bushes, of flowers about to erupt into full bloom. And then you spot your garden tools sprawled on the ground, or your hose in a complete disarray. You don’t want those paraphernalia to ruin the view. 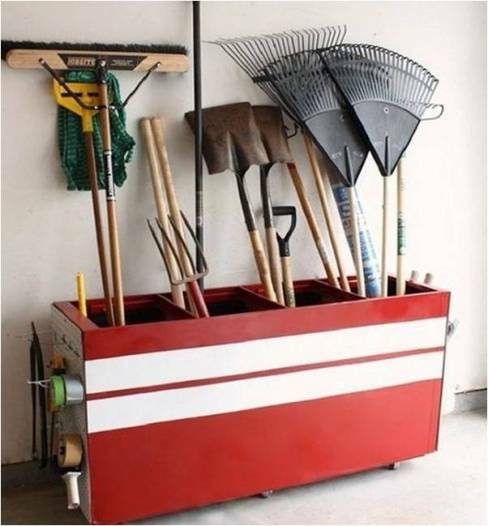 Here are some easy DIY storage activities that you can do to hide those gardening tools out of plain sight. 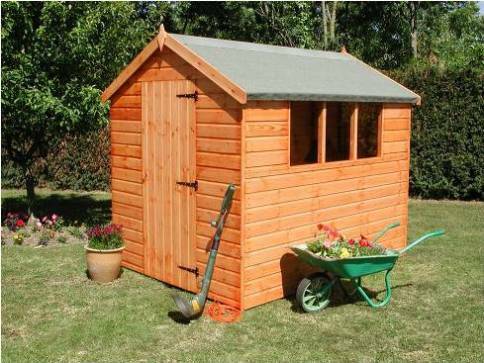 Make sure to invest on a garden shed or outdoor storage locker. If you don’t have any, consider crafting one from unused wood and paints. It is, needless to say, an extremely convenient way to effortlessly hide your supplies. Use hooks and hangers! These tiny items perform a remarkable job in saving up some space. 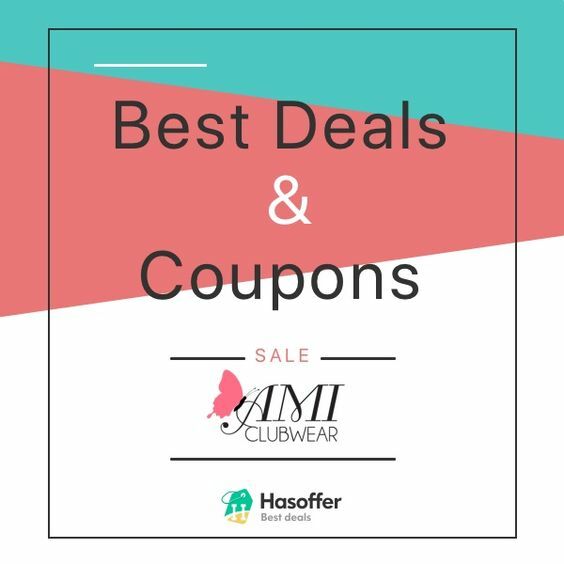 Use them to hang brooms, dustpans, and other cleaning tools. You can also suspend cords in them. For your hose, you can coil them in a coat hanger. Buy storage boxes. Not only does it help in storing up your things, it also helps in keeping them organized. Stack them together tidily and label them. Aside from storage boxes, you can also utilize metal storage shelves, such as shoe racks. Bring out your creative and resourceful side. 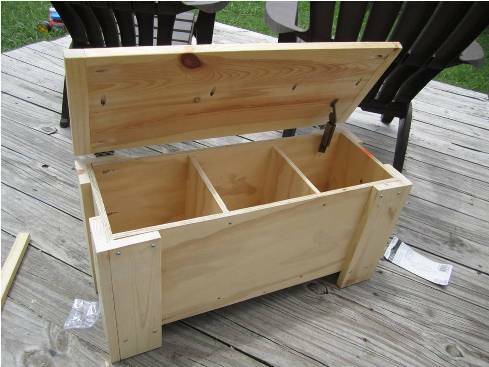 Take out your tool box, spare wood, paints, and begin fashioning stunning and useful storage items. 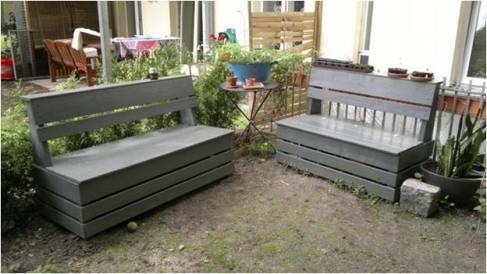 Transform wood planks into storage benches. Place hinges on the seat, as it will serve as the opening lid of your storage. Aside from benches, you can also convert these planks into coffee table storage. I’m sure that you often see mounds of wooden pallets outside gardening or construction stores. They’re cheap and might appear unsightly—but don’t underestimate them. They can do wonders in clearing some space in your garden. 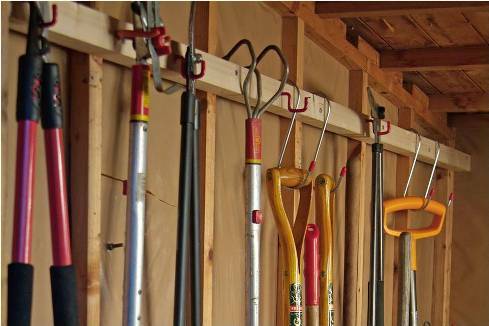 You can use a wooden pallet to hang gardening tools (such as shovels and hose). You can inject potted plants every now and then to make the pallet more aesthetically pleasing. You can also repaint it! Wall racks aren’t just limited to the interiors of your home—you can also bring them outdoors. All you have to do is drill holes near the edge, and make sure that you can suspend your long-handled cleaning tools on them securely. Refurbish old file cabinets. Junk the drawers, then position the cabinets horizontally on the floor. You can now use them to store your cleaning materials. Reuse your metal drums or cylindrical containers to store your hose. Bear in mind that DIY storage projects aren’t just restricted to home décor or home improvement—your garden also needs them. 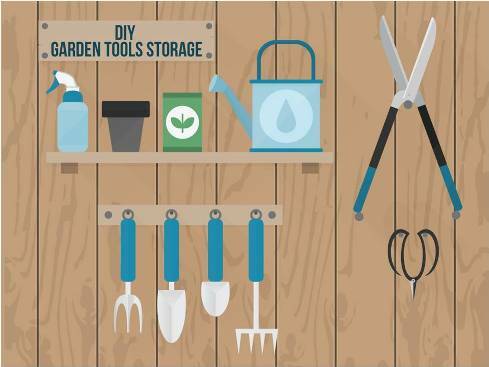 After religiously taking care of your garden, of making sure that the verdant bushes are dense, that the flowers are blooming, you certainly wouldn’t want your unappealing gardening tools to sully the scene—and this is where storage kits can come in handy.